These little cakes are so easy to make and a fun alternative to baking cupcakes for a special occasion or birthday! Mini Cupcake Cakes aka "Cuppie Cakes"
Spray standard size cupcake pan with non stick spray and bake without cupcake liners (or remove the liners from your cupcake before you begin). 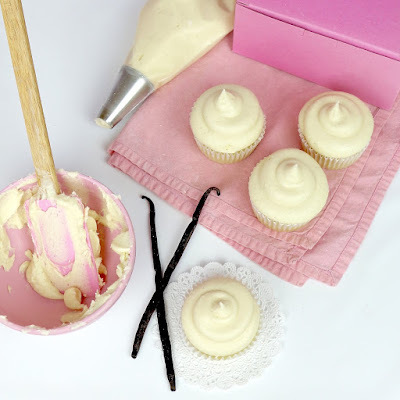 Using a sharp serrated knife, gently saw off the top of your cupcake. 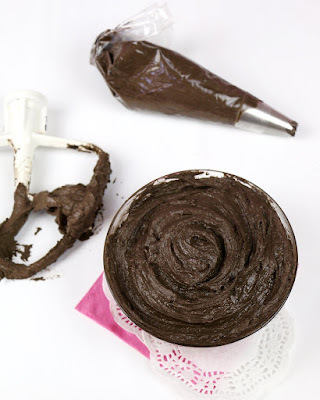 Flip your cupcake upside down and frost sides and top with a metal spatula, just like a cake. It's ok if you can't get your frosting smooth. Simply pat on some sprinkles to cover up any flaws around the sides of your cake. Using your spatula, gently slide it under your cake, lift if up and transport it to your serving plate. I piped a shell border with a star tip to give it a nice finish. You can repeat this process using mini cupcakes and place them on top of the standard cupcakes to create a 2 tiered cake!